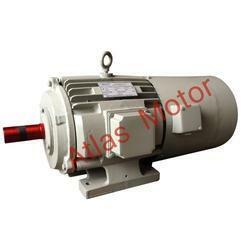 We are Manufacturer, Supplier, and Exporter of “Atlas” Brand Torque Motors. A. C. Torque Motor is used in various applications where the rpm of the motor is required to be changed with constant torque. Torque motor speed controlled either by providing three phases variac in series with the stator winding. Torque Motor is supplied in a robust, rugged cast iron frame with integral feet. On Request, we can supply motor in the aluminum body up to 100 L frame. In the application Which Needs to drive motor on Low Rpm for a long time or continues we suggest higher Frame size. Torque Motors are supplied with class F insulation as standard feature Also supply H on request of the customer. Torque motors are Design to Work Continues. Torque Motor Supply with S1 Duty. A c Torque Motor Supply volts 415 ± 5% 50 Hz. ± 3% customer request we are also able to supply motor in 220, 380, 460, 525 volts on 50 or 60 Hz also. Torque Motor Rotor is positive locking with the joint so that cannot move on high Full lord Torque. Shafts and Rotor are made by the En-8 material. Every rotor is dynamically balanced. It makes motor low amplitudes of Vibration & noise. We supply the motor with Ingress protection 44 Protection as defined in IS: 4691. Torque motors are Supply with Enclosure T.E.F.C. and T.E.S.C. For Sp. Application Where the need to run the motor in more than 75% lower Rpm for that We supply Torque motor with Force cooling arrangement. it can improve to the motor winding longer life and trouble free working. We can also supply Torque motor with T.O.P Switch on Demand of Customer. It can provide motor extra safety form overlord protection. Bearings are adequately lubricated with lithium-based high temp up to 150 deg. All the motors are supplied with C3 ball bearing & fully charged with lithium base grease at the time of assembly. Torque Motors provided with minimum two earthling terminals. One in the terminal box and other on foot. All Torque motor is painted with semi-glossy synthetic enamel paint. However sp. Paint is available on request. Torque motor used in textile industries, wire/cable winding machine, plastic industries, paper mill machine, Steel rolling industries, machine tools, etc. Torque motor widely Use in Application where the need to material wind on drum or beam. We are involved in offering high-quality High Torque Electric Motor to our valuable customers. 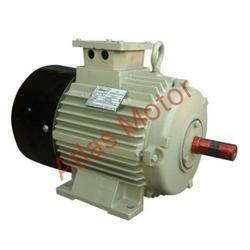 Manufactured from the finest quality raw material, these motors are widely used in various industries. In addition to this, the offered range of motors is widely admired by the clients for its finest quality and optimum performance. This product is offered at the budget-friendly price from us.